When a state’s official nickname is “The Sunflower State,” that’s a good sign that sunshine is abundant. An agricultural state, Kansas is known for several high-yield crops. The state is one of the largest and most elevated in the Union, and not necessarily as flat as most people assume. The western side of Kansas experiences very hot and dry summers, receiving as much sunshine as Arizona and California. Winter temperatures vary wildly, thanks to foehn winds. The rest of the state has a subtropical climate, with hot, wet summers and mild winters. It would be almost nonsensical for Kansas not to encourage the harnessing of solar panel power. Unfortunately, nonsense reigns for now. While the state doesn’t offer many incentives, you can still benefit by installing a solar energy system. To find out how, keep scrolling. Before you dive into the details, take a moment to look at the Swanson Effect graph above. This graph indicates the changes in the per-watt price of solar energy since 1977. While a solar panel system was once practicable only for the ultra-wealthy, it’s now possible for almost anybody to install such a system affordably and beneficially. It’s likely that these prices will drop even further over the next several years as technology improves. So let’s see what kind of return on investment (ROI) you can earn on Kansas solar panels. The graph above shows your potential ROI for a 25-year commitment to a solar installation in Kansas. The three options—buying with cash, buying with a loan, and buying a small system with a loan—are all beneficial to you. However, which one you choose depends primarily on your financial standing and credit rating or equity. Because Kansas repealed its RPS, leases are not currently an option. If you can swing a large investment up front, you’ll be set to see big returns down the road. For most people, however the home equity line of credit (HELOC) route is a more feasible and lucrative alternative for your solar panels. With no money down, you’ll get a tax break in the first year and still make many thousands at the end of the 25 years. Even if you qualify for only a small system, you can make a few thousand dollars over the lifetime of your solar energy system in Kansas. Ready to find out more? Let’s go! Compare the graph above with the loan graph below. Technically, a loan offers the best ROI. That’s because even though you’ll make over $19,000 over time from an outright purchase, you’ll have paid out over $21,000 for the installation. However, if you want to be in control of your Kansas solar energy system from the start, paying up front is the way to go. You’ll get a federal tax credit of 30 percent for your solar energy system after the first year, and the savings on your electric bills will persist over the lifetime of the system. Taking a loan to pay for a big purchase isn’t always the right choice in general, but when it comes to solar power, it definitely is. You can pay for your installation with bank money, but as the owner of the installation, you receive the 30 percent federal tax credit! After that, you’ll see substantial savings on your energy bill every month. The chart above shows that you’ll be spending some of your own money during the period of the loan, since the loan payments will exceed your electricity bill savings. That’s because the electricity rates in Kansas are about average for the nation. However, for the last 10 years, your savings will compound exponentially. You’ll save almost $1,500 yearly and wind up with a total of over $10,000! If you qualify for a home-equity line of credit (HELOC) of approximately $21,000 and a fixed interest rate of 5 percent or less over 15 years, there’s really nothing to lose with this option. If you don’t qualify for a large solar panel installation loan, don’t sweat it. You can still make some money with a smaller system. 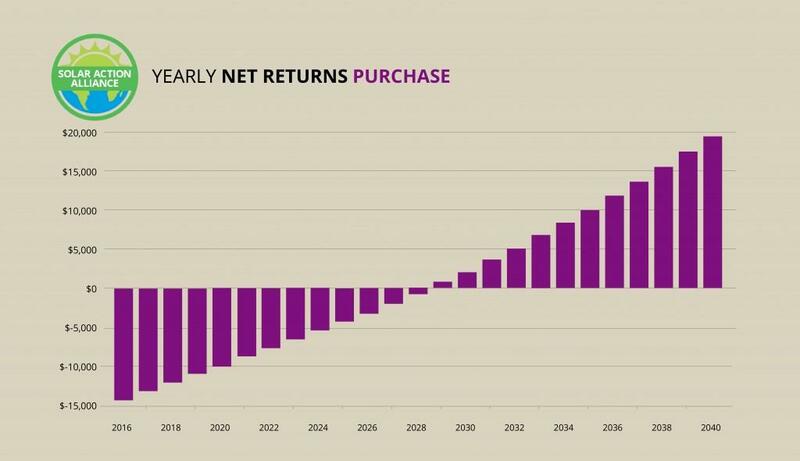 If you look at the graph above, you’ll see that the general spending pattern follows that of the larger loan option. You’ll get a credit in the first year, spend more than you save for the duration of the loan, and then earn some money during the last 10 years. So even with a small solar energy system, you can make almost $4,000! All you need is a loan with similar terms (15 percent interest over 15 years), but for less than half the amount required for a full-size system. When a state enacts an RPS, it means that the state requires utility companies to start pulling electricity at least partially from renewable sources, such as solar panels. Shockingly, Kansas used to have an RPS but repealed it in 2015. Why the governor chose to make this program voluntary is a mystery. If that’s not odd enough, consider the fact that Kansas generates a lot of wind power—another renewable source. So essentially, utility companies had it in the bag to meet the requirements of the RPS, even if not through solar energy. A strong RPS would create jobs in clean energy, empower residents to participate in power sourcing, and help keep the state beautiful. There’s really no logical reason not to have an RPS in Kansas—except to please the utilities, which prefer to remain in control, financially and otherwise. Solar energy is perfect for a sunny, expansive state like Kansas. For some reason, lawmakers don’t get it. 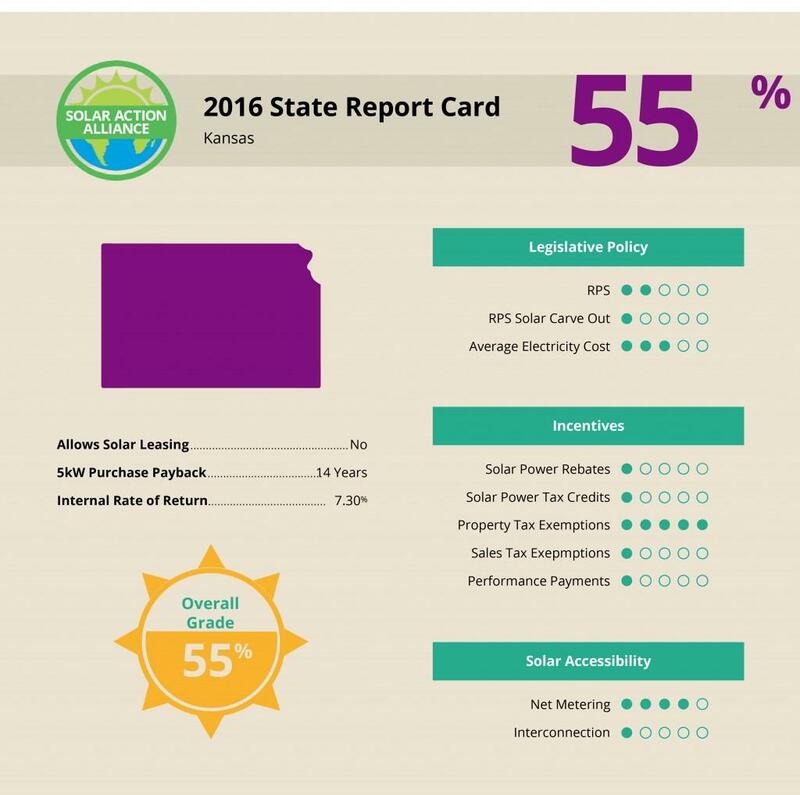 Overall, The Wheat State gets a “D” for its depressing stance on solar power. Every time legislature seems to make a baby step, it falls right on its bum again.